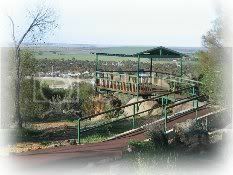 Kellerberrin is a townsite in the central agricultural area of Western Australia, 203 km from Perth on the Great Eastern Highway a comfortable 2.5 hours drive from Perth. The name Kellerberrin is Aboriginal, and is derived from the name of a nearby hill. The hill was first recorded as "Killaburing Hill" by an explorer in 1861, but in 1864 the explorer C C Hunt recorded it as Kellerberrin Hill. One source claims that Kellerberrin is the name for the fierce ants that are found in the area, while another gives it as meaning "camping place near where rainbow birds are found"- "kalla means camping place or place of, and "berrin berrin" is the rainbow bird. The railway line from Northam to Southern Cross was constructed through here in 1893-4, and this section opened for traffic in 1895. Kellerberrin was one of the original stations when the line opened. By 1898 there was a demand for small blocks of land in the area, and the government surveyed a number of 20 acre lots the same year. The area was gazetted as Kellerberrin townsite in 1901, and the government soon made more land available for settlers. Wheat and sheep farming and the manufacture of agricultural equipment are the main industries of the small town of Kellerberrin located in the centre of the wheatbelt region 203 Kms from Perth on the Great Eastern Hwy, a comfortable 2.5 hours drive from Perth.